In our new feature On The Road: Let's Bike Austin, we took a trip to one of our favorite southern cities, where we put together a cycle gang of creative locals and toured downtown, hopping off at their go-to pitstops along the way. We documented the trip: Jotting down directions and taking notes to create an official Austin Bike Map, perfectly curated by our fellow cyclists. So follow their route and see the sights — the Austinite way! First stop: El Chilito's Tacos and Café. Start your day here with the best breakfast tacos in town. There are vegan options and an organic coffee bar, where you can start the day with a fresh cup of joe served hot or on ice. If you're not on wheels, we suggest trying out their delicious frozen mimosas and sangrias to cool off from the hot morning sun (please don't drink and ride). UO TIP: Don't worry if you wake up too late: Breakfast is served all day! After breakfast, head south and make sure to stop by Iglesia La Luz Del Mundo. In English, its name translates to "The Light of the World." While seemingly small, the church has an international following of around five million with 3,500 established places of worship around the world, making this short pitstop a true hidden gem! UO TIP: Our favorite part about this little church is its unique architectural style. At night, the Light of the World sign is lit up! This progressive bookshop sells cool new (and used) books, zines, tees and more with topics ranging from architecture, counter culture, fashion, film, photography and beyond. They also have an art gallery featuring a variety of openings year-round, most recently displaying the works of Massachusetts-based artist Emma Kohlmann. UO TIP: Need a boost of energy? Stop by Flat Track Coffee in the back! Flat tire? Wonky rim? Rusty chain? 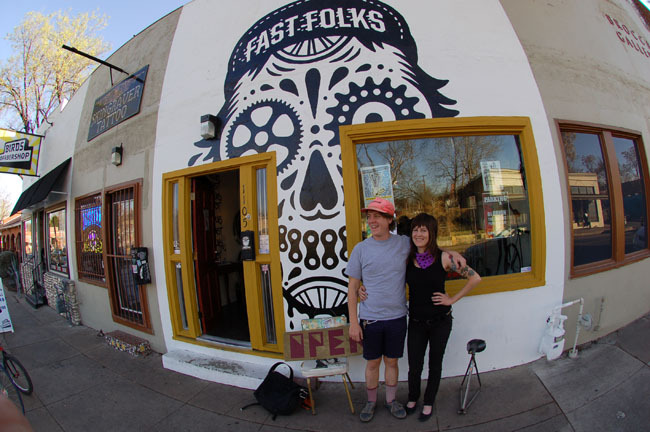 Take a break at Fast Folks Cyclery, an independent full-service bike shop, for all your riding needs. This shop is animal friendly—we've spotted puppies, piglets, and cats (#samsoncat)—and if you're lucky, you might get to wear the Fairdale Box on your head. P.S. Is it just us or does working here look like the coolest place ever? UO TIP: Safety first! The shop motto may be "Live Fast or Die Trying" but if you don't have a helmet, here's the perfect place to pick one up. Briskets and ribs and sausage, OH MY! Franklin BBQ is our #1 pick for your lunchtime pitstop! The two-hour line is well worth the wait—just keep your eyes closed in the meantime to keep from drooling all over yourself. UO TIP: They open at 11AM and close when they sell out, so don't wait too long to get there! Catch an afternoon matinee at Austin’s best movie theatre. With daily themes (like Terror Tuesdays, Weird Wednesdays and Quote-Alongs) you'll be able to catch a ton of really fun films at a super low price. UO TIP: Don't forget to check out the Calendar! Pop-in here for tacos and two-stepping! There's live music seven days a week, a giant dance floor, pool tables and… get ready for it… WHISKEY ON TAP! We don't blame you if your trip stops here—it's a great place to stay all night. UO TIP: Make a quick trip to the bathroom to pat the sweat off your face because The White Horse has a photo booth! Hop off your bike for a bit to walk this hip strip, checking out the local stores, restaurants and venues. First Thursdays are the best time to see this Avenue at its best. It's an all-ages party with stores open late, special sales, and free drinks (or drink specials) for those who are 21+. There's something here for everyone! UO TIP: Head here at sunset for beautiful skyline views. Plain on the outside, insane on the inside! Prototype is the go-to vintage store for Austin’s stylish set. Every blogger, vintage shopper and clothing lover has walked through these doors, scoring one-of-a-kind pieces with a southern twang. Even their website is freakin' perfect! Check it out for news, look books, and to get the scoop on the adorable trio who owns the store. UO TIP: Bring some extra cash. It's impossible, I repeat, impossible, to leave the store without buying something. Don’t miss this store full of wild antiques. They have everything and anything your brain can dream up. It's the ultimate store for home décor, rare knickknacks and gifts for your friends. Even Yoko Ono makes sure to stop here when she visits Austin! UO TIP: Don't be afraid to dig around the store and take your time—this place is full of hidden treasures that are not noticeable at first glance. Catch a show at Austin’s best music venue. Some of biggest acts have preformed at this outside venue that has been renovated out of recycled materials. With a main floor and a balcony view, you can see your favorite artist up-close and personal. UO TIP: Go all out and get ready to have the best night of your life—just be prepared for crowd-surfers! Fuel up at Top Chef winner Paul Qui's ramen trailer around the side of the Hole in the Wall. Hole in the Wall's venue has a full bar and a local's-only feel to it, but the friendly folks inside will make you feel right at home. All roads end here: A Dive-y karaoke bar with a huge songbook. Once a pretty low-key place, Ego's has made a name for itself in Austin as the go-to karaoke spot in town. It gets super packed on the weekends so if you can, try a weeknight for a smaller crowd! UO TIP: Get there early and have your song list ready to go. This will guarantee you get a spot on the list... or maybe even two.